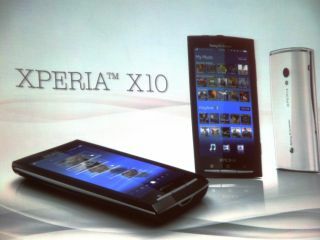 Sony Ericsson has announced its first foray into the Android arena, with the Xperia X10. Previously thought of as the Rachael / Xperia X3, the new X10 is the best collection of hardware to use the Android OS, with a new overlay giving a new way to search the phone and internet for new content. It uses a 1GHz Qualcomm Snapdragon processor, giving it unrivalled speed in executing programs (we hope - our early hands on hints at a phone that still needs a decent bit of development work on it). It also has an 8MP camera with LED flash, autofocus and coolest of all - automated face tagging. This means every photo you take of a certain person will be found and sorted for you, rather that you having to manually point out each instance. The screen is a 4-inch WVGA, meaning top end 800 x 480 resolution. It's only thanks to the recent upgrades in the Android firmware that these higher resolutions have been possible, although the X10 only brings Android 1.6, rather than the Google Navigation-toting Android 2.0. The X10 also features a 3.5mm headphone jack and microUSB port for PC connectivity and charging, and there's a microSD slot (with 8GB bundled card) for memory expansion. But here's the bad news - Sony Ericsson is launching the phone in Q1 2010, likely in January or February, so there's going to be a bit of a wait to get all the latest Android hardware.